Knowing how to spot a fake diamond can keep couples from falling for jewelry scams while ensuring that they can find a lovely diamond suitable for their preferences and budget. Although the only way to truly guarantee a stone's authenticity is to submit it for an independent, professional appraisal, knowing a few tips can keep couples from making most poor decisions. There are several ways couples can examine gemstones to help determine whether or not they are real diamonds. Understand Diamond Quality: Couples who know how to judge diamond quality by the four Cs -- color, cut, carat, and clarity as defined by the Gemological Institute of America -- are less likely to be fooled by false gems because they can immediately discern poor quality imitations. Check Setting Quality: Diamonds are expensive gems, and true diamonds are rarely set into inferior metals with poor security or placement. 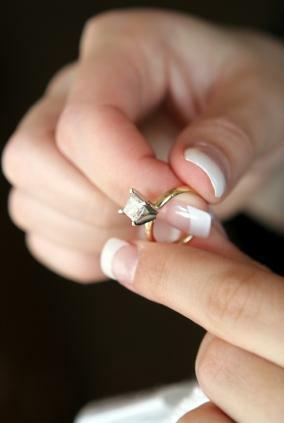 If an engagement ring's setting is crooked, loose, or poorly crafted, the stone may be less valuable than advertised. Fog Test: Diamonds disperse heat rapidly and a light huff of breath on the stone should fog it up but that fog will vanish almost instantly. 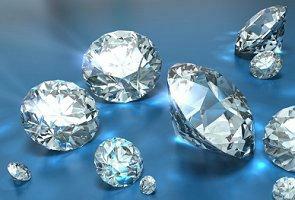 Fake diamonds may stay fogged for 2 seconds or longer according to National Jeweler's Supply. Reflection Color: Because of the refraction index of diamond, the reflection and sparkles within the stone should be in shades of gray. According to Business Insider, stones that have rainbow reflections are likely not genuine diamonds. Transparency Test: Diamonds should not be truly transparent. Diamond Cutters International recommends turning loose diamonds upside down over a newspaper or other piece of paper with typed words printed on it. If you are looking at a real diamond, you will typically not be able to read the text through the stone. If you can read the text, the stone you are looking at does not have the proper light dispersion properties a real diamond possesses. Ultraviolet Light: About 30% of diamonds will glow blue under ultraviolet lights such as black light. Fake diamonds, on the other hand, will glow other colors or not at all. While an extremely high quality gem will also not glow under UV light, this can be a good test for questionable stones if done in consultation with a trained jeweler. Loupe Examinations: Use a jeweler's loupe to examine the diamond closely. A real stone should have sharply defined facets with precise geometry, while fake stones may be less well crafted. On a real diamond, the stone's thin girdle will also be faceted, and some designer diamond shapes such as the Hearts on Fire diamond will have identification numbers inscribed along the girdle. There are many types of simulated diamonds available in today's jewelry market, and while some people may refer to them as "fake" diamonds, they can be beautiful gems in their own right. Understanding the different types of diamond look-a-likes can help couples discover whether they truly want a natural diamond -- formed from heat and pressure deep beneath the earth's crust -- or if an artificial stone is suitable. Cubic Zirconia: This is a common lower-cost substitute for diamonds and has many of the same properties as real gems, though it is substantially heavier -- weighing as much as 55 percent more than real diamonds according to Diamond Cutters International. Moissanite: This rare mineral, which is actually more expensive than real diamonds, looks very similar to the real thing. Even jewelers have a hard time telling the stones apart. However, moissanite has radically different chemical and physical properties from diamond, resulting in rainbow refractory qualities that look quite different from the grayish refractory of a diamond. See Moissanite.net to see the difference for yourself. Lab Created Diamonds: These diamonds have identical physical and chemical properties to natural diamonds, but they are grown under carefully controlled laboratory conditions rather than mined from the earth. Because they are not natural, they are often more affordable options. Other than the fact that lab-created stones not natural, they differ from colorless and flawless diamonds only in that they do not have the level of hardness as real diamonds, according to Lab-Diamonds.com. Crystal: Faceted crystal can be lovely but it lacks the durability and beauty of a gemstone. According to the Diamond Authority, crystal does not have the brilliance and sparkle of diamonds. Crystal rings may be very cheap, but the lower quality makes them a poor investment. The only true fake diamond is one that is dishonestly portrayed as diamond when it is, in fact, a different type of stone. By knowing how to check for a diamond's authenticity, couples can protect themselves from unscrupulous individuals and find a gem they appreciate, whether it is a natural diamond or not. While there are several easy tests for how to spot a non-authentic diamond, the only guaranteed valid test is to submit the gem for a professional appraisal. To ensure unbiased results, couples should avoid using a jeweler's in-house appraiser. An independent, professional appraisal by a certified and experienced gemologist is the single best way to tell the difference between real and fake diamonds. A gemologist can examine a stone in many ways that are unavailable to consumers, and they can issue a report on their judgment of the diamond's quality and value. An appraiser will do thermal, weight, and fluorescence tests on the gem to certify its composition and value, and will provide a certificate of the gem's authenticity that can be valuable for insurance purposes. Understanding how to spot a fake diamond can keep couples from making a financial blunder while at the same time helping them realize that not all fake stones are worthless. A diamond engagement ring -- natural or not -- is only worth as much as the relationship it represents, and even the least expensive crystal ring can be priceless to the couple who shares it.